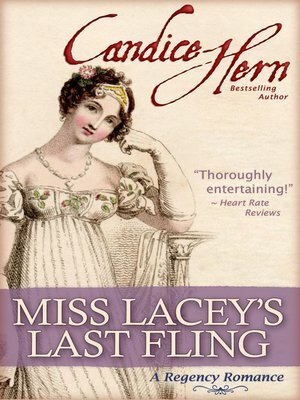 Fans of the traditional Regency Romances of Georgette Heyer, Barbara Metzger, and Carla Kelly will enjoy this witty, award-winning Regency romp by New York Times bestselling author Candice Hern. Miss Rosalind Lacey has spent all her 26 years in the country, quietly managing the lives of her widowed father and five younger siblings. When she learns she has contracted the illness that killed her mother, she decides to spend her last few months doing all the things she's never had the time or opportunity to experience. With the help of her worldly and notorious aunt, the simple country miss is transformed into a dashing Town sophisticate who cuts a wide and wild swath through London Society. Since she won't be around to face the consequences of her behavior, Miss Lacey does and says exactly what she pleases, even becoming involved with the infamous rake, Max Davenant. It is an exciting and heady time for the one-time country mouse, until she receives a fateful letter bearing news that turns her glittering new world upside down. The ballrooms and gaiety of the London Season form a backdrop for this sparkling tale of a young woman who hasn't lived enough, and a man who's lived too much.